Please take HKI GMB route N69X for late night services. Hing Wo St Wah Fu Est. * Service after 23:30 daily will be diverted to operate via Wah Fu Est as below. Passenger may enjoy $2.4 fare discount on this trip (Causeway Bay bound) when interchange from HKI GMB route 69, 69A or 69X (from Bel-Air on the Peak to Cyberport) by using the same Octopus within 60 min. Passenger may enjoy free-rider on HKI GMB route 39M (Tin Hau bound) or 56 (North Point bound) when interchange from this trip (Causeway Bay bound) by using the same Octopus within 60 min. Passenger may enjoy $3.9 fare discount on this trip (Cyberport bound) when interchange from HKI GMB route 4M (Shek Pai Wan bound) by using the same Octopus within 60 min. 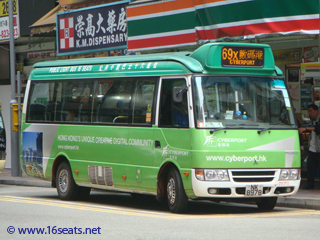 Passenger may enjoy $2.4 fare discount on HKI GMB route 69 or 69X (from Cyberport) when interchange from this trip (from Bel-Air on the Peak to Cyberport) by using the same Octopus within 60 min.